ABOVE: The altana (a Venetian word for "roof terrace") at the Ca' Pisani. 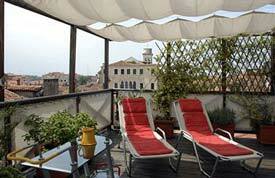 Location: In the heart of Dorsoduro, by the Gallerie dell'Accademia and the Accademia Bridge. Closest Alilaguna Airport Boat stop: Zattere. You want a stylish four-star boutique hotel away from the crowds, but near the important tourist sights. The 29-room hotel has a roof terrace where you can relax in nice weather, and the hotel's summertime wine & cheese bar--La Revista--serves drinks, snacks, and light meals inside or outdoors. From the Hotel Ca' Pisani, it's only a two- or three-minute walk to the Accademia Bridge, which leads toward the Campo San Stefano, the Piazza San Marco, and the city's upscale shopping district. (The hotel itself is on a wide tree-lined pedestrian street, the Rio Terà Antonio Foscarini, that runs straight across Dorsoduro from the Grand Canal to the Giudecca Canal and the Zattere airport-boat landing. Ca' Pisani is especially handy if you're arriving or departing on a ship at Marittima, the larger of Venice's two cruise terminals. Alilaguna's Blue Line boat stops at Zattere (a few blocks from the hotel) on its route between the Marittima piers and Venice's Marco Polo Airport.